Happy friday. I’m loving the longer days, and the bushes are starting to turn green. I was inspired for todays manicure by Kelli Marissa formerly known as The Nail Polish Challenge. She did a really cute pastel neon dotted manicure. You can find the original on her Instagram account. I started with three coats of Wet n Wild French White Creme. Once that was dry I dotted the first curved line with China Glaze Feel The Breeze. I continued with Cult Nails Love at 1st Sight, China Glaze Boho Blues, China Glaze Treble Maker and finally China Glaze Highlight of my Summer. 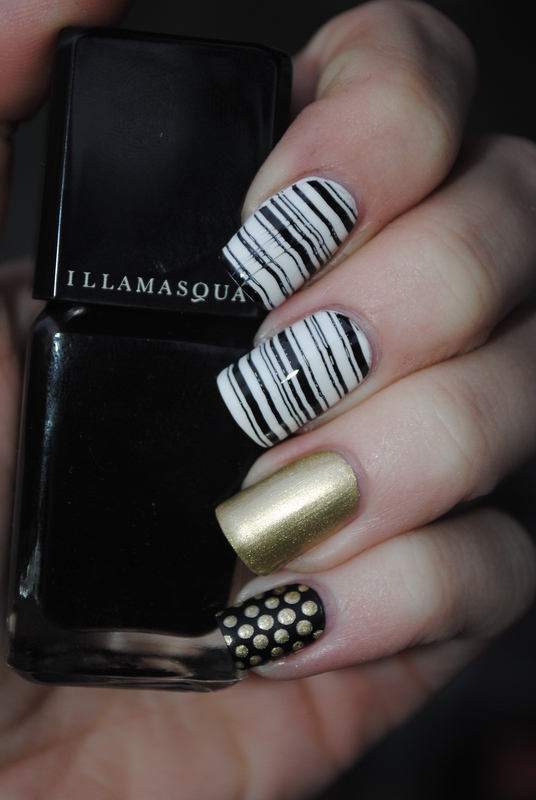 I varied the placement of the dots on the nails so it wasn’t the same pattern on all the nails. I wish I had used some more pastel colors. The pink and purple where a little to muted or dark looking back. Remember to click by the other ladies. I dag leger vi med prikker. Jeg blev inspireret af noget nail art Kelli Marissa havde lavet på Instagram. Husk at klikke forbi de andre for at se hvad de har lavet til i dag. Happy Friday. I’m finally feeling better again after the flu. Todays theme is cakes, I have previously done cupcakes and another nail art inspired by cakes, which can be seen here and here. I went to google, to get inspired for todays nail art, and scrolled through a lot of cakes before finding this one on Weddbook.com. 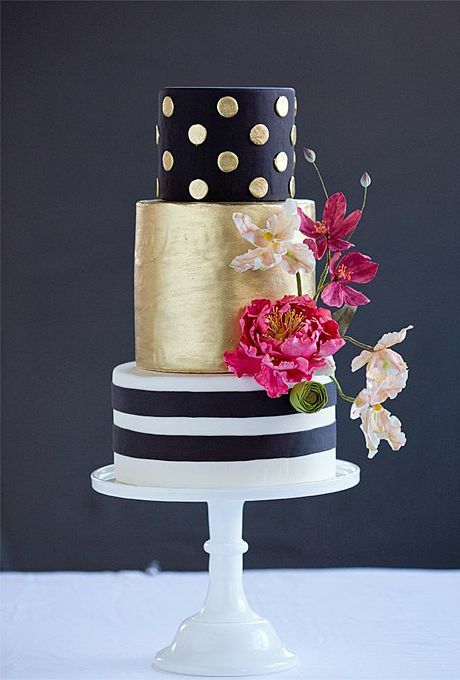 I really liked the different textures and designs on this cake, and could instantly see this done as a skittlette. I also found some other cakes, that I have saved in my inspiration folder, if I run out of ideas in the future. I started with three coats of Wet n Wild French White Creme on my index and middle finger, before stamping with MoYou London Black Knight and MoYou London Holy Shapes 08 Plate. I turned the striped design on its side so the lines matched with the bottom tier of the cake. The didn’t stamp quite straight, even though I tried to stamp them on straight, and of course my index finger smudged a bit with the topcoat even though I waited a couple of minutes for it to dry. On my middle finger nail I have two coats of Barry M Gold Foil, to represent the middle tier on the cake. On my pinky nail I painted two coats of Illamasqua Scorn, a beautiful matte/satin black polish. After that dried I dotted with Barry M Gold Foil and a medium large dotting tool. I left out the top coat on this nail to have a contrast between the dots and the base, just like on the cake. I did the same design on my thumb as my pinky. Remember to click by the other ladies to see what they did for today. I dag er temaet kager, så jeg måtte lige en tur på google, for at finde en kage jeg kunne blive inspireret af. Jeg er vild med kontrasten på kagen mellem det sorte og guld. Husk at klikke forbi de andre for at se hvad de har fundet på i dag.